I’ve never been much of a tackle tart (those that have seen my gear, can testify to this!) if I’m happy with something I see no need to change it and in the case of bigger items like seat boxes and poles, I can’t afford to buy the latest model every year. So if I find a particular range of floats that I like or a hook pattern that never lets me down, why use something else! Where possible I try and simplify things and a handful of hook patterns cover 99% of the fishing I do, for example somebody put me onto Tubertini 808’s for silvers fishing on commercials and I’ve happily used them for years, landing loads of carp on them as well. A lovely versatile hook and I’ve used it with expanders, worms, maggots, casters, corn and even dobbing bread for carp in the winter. The only slight niggle I had with them was that sometimes they’d lose their points very easily, no big drama to change the hooklength and certainly not the end of the world but sometimes you’d go a whole match with the same hook and the next time you’d find yourself reaching for the hooklength box several times during the day. 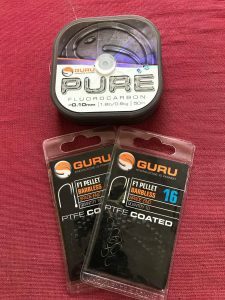 Then Guru brought out a new range of hooks and on a whim one day, I bought some F1 Pellet Barbless hooks to try along with a couple of spools of Pure Fluorocarbon as people were saying how good it was. I tied some up and I have to say I was blown away by the F1 Pellet hooks in particular, they’re a fine wire hook but I’ve had carp up to 8lb on them when I’ve been fishing for skimmers and I’ve never had one straighten out, they’re razor sharp too and because of the PTFE coating they stay super sharp, just brilliant hooks and I now use them for all my skimmer fishing on commercials. I was also really impressed with the fluorocarbon, I have heard people say that it’s brittle but I haven’t found that at all and have been using it in 0.08, 0.10 and 0.12mm. 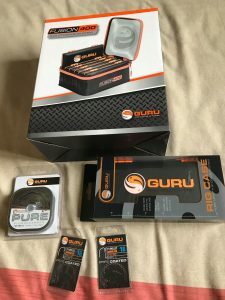 As for storing my hooklengths, I use the Guru rig cases which I think are brilliant, I bought my first one back in 2014 and reviewed it which can be found here if you’re interested. Well that box is still going strong after more than five years and I’ve since added two more (another six inch case and the longer twelve inch version) and they hold more than enough hooklengths for my needs. 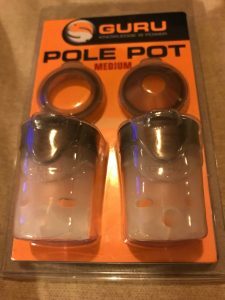 I’m also a big fan of their pole pots and have several items from their Fusion EVA range and I can’t fault any of it. Now this is starting to sound a little bit like a Guru love-in and I make no apologies for that, hence the title although I’m in no way affiliated with the brand. 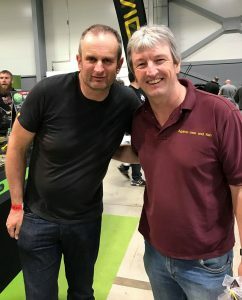 Both Guru and Korda seem to divide opinion somewhat, supporters of both brands seem to be hugely passionate and can’t wait to get their hands on all the latest products whereas the detractors seem to dislike them with the same degree of fervour. For my part, as much as I like the Guru products I’ve purchased and will undoubtedly buy other items from the range, I won’t be rushing out to buy Korda waterproof socks or Guru branded trainers! When Guru first appeared on the scene, I must admit I thought it was a bit gimmicky with it’s garish colour scheme and innovative but expensive terminal tackle, what followed was a masterclass in branding and marketing, from the rather cool yin and yang inspired logo to the big name signings, Dean Macey, Matt Godfrey, Steve Ringer and more recently, Frankie Gianoncelli among a host of others. They’re all extremely media savvy and appear in loads of magazine articles and videos. 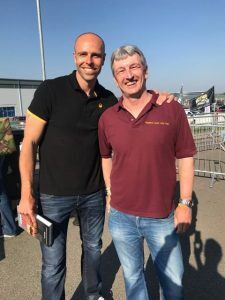 They also attend all the big angling shows and their stands are very impressive and always busy, the Guru’s themselves come across as engaging and super keen but most of all, that they love what they’re doing. 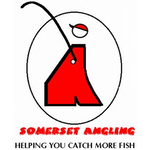 Then there are the numerous TV shows that are extremely popular and the crossover between the Guru and Korda camps is genius, you’ve got The Big Fish Off with Dean Macey, Ali Hamidi and a host of celebrities, Fishing Allstars with Macey, Adam Rooney and top names from the fishing world and Monster Carp with Hamidi, Tom Dove and Neil Spooner. The dynamics of all three work really well, Dean and Ali make great team captains in Fish Off, Adam and Dean work really well as a double act and the three carp boys are just brilliant, I’m not a carp angler but absolutely loved the Monster Carp series. Guru also puts a huge amount back into the sport, they sponsor the England under 15’s team along with the Talent Pathway and there’s the Match Academy too, Korda are also involved in loads of very worthy initiatives, of course it does their brand’s reputation no harm at all and at the end of the day if firms don’t invest in young talent and getting youngsters into fishing, there is no future for this great sport of ours and ultimately for tackle firms, nobody to buy their products! 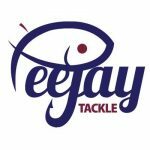 On the tackle front, they’ve been very clever in lots of ways, yes they have come up with some brilliant bits of kit but they’ve also realised there’s no point in trying to compete with companies who already produce some of the best, top end tackle out there. So there’s the collaboration with Rive to make Guru seat boxes and working with Daiwa to produce the Aventus range of rods. 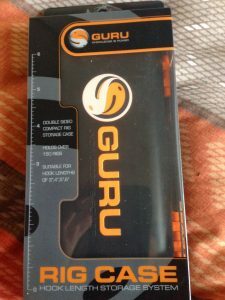 Rive are seen by many as one of the top box manufacturers in the world and although expensive, they were always going to be a hit with Guru fans and I’ve seen a fair few on the bank. The rods on the other hand, I’m not so sure they’ve been as successful, they are undoubtedly gorgeous, prestige, precision bits of carbon but they are also prohibitively expensive and if you could afford them, why wouldn’t you go for Daiwa rods as you are paying extra for the Guru name! They’ve also just brought out Micro Cubes which to all intents and purposes are exactly the same as Preston’s Stotz, again a very clever move I feel, I’ve been a big fan of Stotz since they came out and have loads but still bought some of the new Guru versions and for all those massive Guru fans out there, they will now buy the orange boxes rather than the red ones! Another new product soon to hit shops and another genius collaboration are the new Guru MW floats. Up and down the country, match anglers have been going crazy for hand made floats for years and when you have the likes of Steve Ringer raving about patterns made by MW or Malman, sales go through the roof. You try and order some from either of their websites, they’re sold out as soon as they’re restocked! 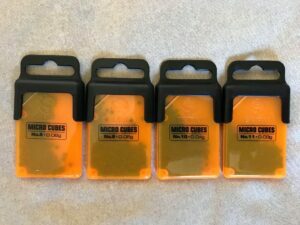 The Micro Cubes are selling like hot cakes! I could be wrong but I can’t imagine Mick Wilkinson will be making all of these floats himself, he’s probably designed them in conjunction with several of the Gurus and they are then mass produced (don’t hold me to that!) but from what I’ve seen they look top quality and I can’t wait to buy and try some, but therein lies the problem and I confidently predict they will be a massive seller, possibly the stand out product of the year and getting your hands on them will take some doing! Their recently launched luggage range has been a huge seller and certainly looks the business, I bought the Fusion Net and it is a cracking bit of kit that screams quality but I do think £59.99 is a little steep! I like the Fusion Base as well but I’ll have to save up for that one! I’ve also bought a Guru landing net at the Big One and at this rate I’ll turn as orange as the Tart! So what next from Guru? They’ve launched loads of new kit like float tubes, a smart looking brolly and the Fusion Mat Bag which is brilliant idea but what can they come up with next, I did notice some grey/silver luggage in the background of a catch shot by one of the Guru’s on Instagram but despite me (and others) commenting on the thread, they’re not saying anything although people are speculating it could be a cool bag. Looking ahead, what about a Guru pole in conjunction with Daiwa or Guru reels from Shimano or Daiwa? 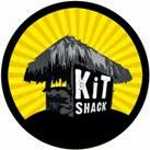 Whatever they do next, you can be sure it’ll be well thought out and once the slick marketing machine goes into overdrive, they’ll sell a shed load!